Every now and then the universe aligns and delivers a boot made for your foot. That happened to me when I tried on a pair of Oboz Sawtooths two years ago. Once I got beyond my surprise at the cushion, and the comfort, of the low cut model of this slight hiker, I could focus on the fit: these boots were made with my foot-wide in the ball and in thetoes, narrow in the heel-in mind. I first tested these on day hikes in South Dakota's Black Hills, and found I forgot to take them off at the end of the day. 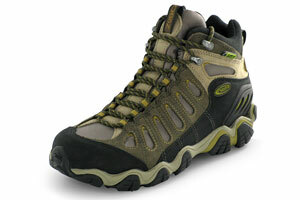 They actually evolved into my favorite around town shoes of choice, and my go to pair for day hikes with light loads. The mid ankle version, the Sawtooth Mid, fulfills the need for a little beefier model for go-light backpacking, offering more support when hiking with a pack, and features Oboz's proprietary membrane for water proofing. Both models sport a double density EVA midsole, which accounts for the robust cushion, and rounded, aggressively lugged outsoles to ensure traction and provide stability and support. These are outrageously comfortable boots, true to Bozeman-based Oboz's commitment to innovation and quality. The fact the company plants a tree for every pair of shoes sold (through Trees of the Future) is an added bonus. A rarity for a pretty heavy-duty hiking boot, these all-leather Steeps offer out of the box comfort you'd expect only from much lighter backcountry footwear. For carrying big loads across trail-less terrain, almost no other boot can rival the Steep GT for stability and cushioning while being as easy on your feet. 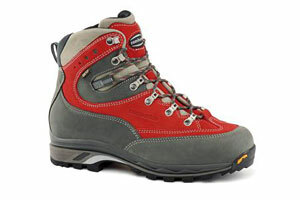 Whether you're side-hilling, wearing crampons, on the trail, or kicking through wet mud, these boots remain comfortable. The polyurethane midsole provides surprising comfort while the toe and heel counters keep your feet in position. On the trail or off, the Gore-Tex liner keeps your feet dry while an aggressively lugged Vibram sole provides reliable traction. These Italian made Zamberlan Steeps come in two colors, but we like the flashy red of the "amaranto" option, it suits the go-for-it personality of these top of the line boots. © 2005-2019 ClassicHikesoftheWorld.com. All Rights Reserved.